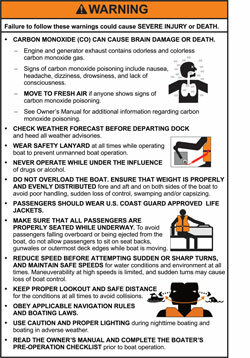 What warning labels are required on recreational boats? Safe load capacity, blower warning labels, certification labels and more. Capacity Labels: Monohull boats under 20 feet except canoes, kayaks, inflatables, and sailboats, are required to have a capacity label. The label in figure 1, is for outboard boats, rowboats, pedal boats and the like. The dimensions given are the minimum allowed. It is suggested you make them larger. This label is there for people to see, so make it visible. Also it must be placed where the operator of the boat can easily see it. So don't hide it. It must be permanently affixed, meaning it's not supposed to fall off, come unglued or whatever. However, don't put it on with screws because then it can be easily removed. You want this to stay with the boat, forever! It also has to be made so it won't fade in the sun or due to heat, cold, rain, snow, ice, or whatever. It has to be the colors shown. In case your monitor doesn't display the colors right, the background color for the mid section is yellow. For other types of boats use the following labels. The dimensions are the same. Delete the words U S COAST GUARD at the top of the label. You may also have to delete the certification statement at the bottom of the label. Any boat that has to meet some Federal Requirement but not Capacity, Flotation, or Horsepower must have at least a certification label. For instance, if the boat must meet the Electrical, Fuel Systems, Ventilation, or Navigation Lights regulations then there must be a certification label. That is simply a label mounted in plain view with the following words. This label may be combined with the capacity label. It must contain the name and place of manufacture. When Do I not need a certification Label? If the only Federal requirement you must meet is to have a Hull Identification number (such as in small sailboats, inflatables, etc) then you cannot have the certification statement, because there is nothing to certify. However, if you install navigation lights then you must have the certification statement. 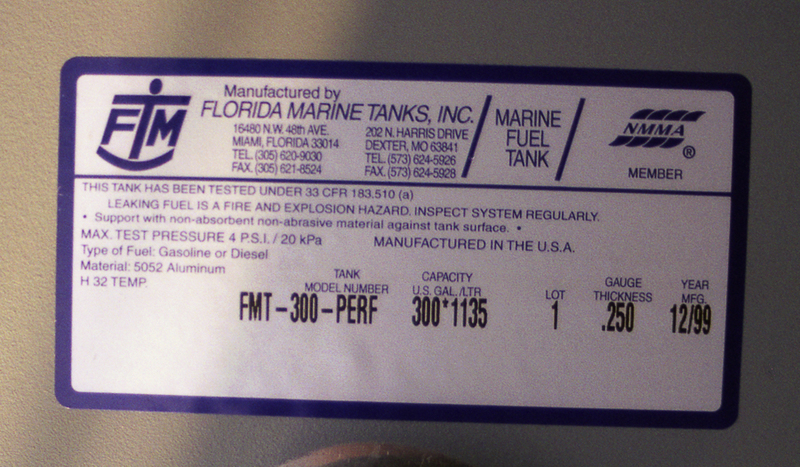 If the tank is tested under §183.584 at less than 25g vertical accelerations the statement, “Must be installed aft of the boat's half length."